Finished Desert Oasis just in time because the webinar recording is posted. Tomorrow, I will look at the recording and make a list of the brushes that I used and tell you the current names in Desert Oasis. I really like this new set and I hope you do. I think I will retire from brush making for a while and just enjoy painting. I have been so focus on classes, the webinar, various videos, and the brushes that I am neglecting to paint. Not good…bad Skippy…bad Skippy. “Yes, you are not like a ‘Good Virus.’ You are definitely a bad skippy, whatever that is,” Kevin popped up on-screen scaring me silly. I hate it when he comes and goes like that. It is positively unnerving. I guess for the new readers, it would be good to explain Kevin. He arrived when I started the blog as a practice blog. I was taking a class and it was time to make my first post. I didn’t know what to write. I just started writing and it seemed I started talking with someone. I actually thought it was my alter ego or inner child…or some other oddity. Over the months, the entity grew stronger and bolder. At some point he announced that his name was Kevin and that he is a good virus…sort of like Glenda is a good witch in the Wizard of Oz. For the most part, he seems harmless. He is actually pretty good company during those long hours on the computer. My online friends like him, but worry about me…go figure. My friends make odd remarks, like did you forget your medications. Or, don’t worry the nurse will be there soon. I don’t know any nurses. Wait, I do know a couple, but they do not know my online friends. It is all rather strange. People send Kevin messages, too. I bet he gets some today. Oh gosh, I digress. Desert Oasis Brush Library containing Desert Oasis Category. Okay…that’s it for tonight. I’ll send the crossover list tomorrow. Wait, one more thing. I did a quick sketch and need to post that…otherwise this post will look very dull. This entry was posted in Skip Allen & Painter 12 and tagged Corel Painter 12 Tutorial Video, Corel Painter 12 Watercolor Brushes, Corel Painter 12.1 Free Brushes, Skip Allen, Skip Allen and Painter 12. Bookmark the permalink. Well, seems like you did it again! Cant wait to try these out ! Thank ever so much Master Skip! Thanks Skip..will fill my rainy weekend..i havent looked forward to a set of brushes as much before as these.. I am so impressed with your watercolor drawings. They are amazing and it look simple to make. But when I want to try and use Cool Spring or Dessert Oassis brushes, I get immediate problems with my RAM. I am running Painter 12.1 on an 4-core Intel processor and 8 GB of RAM. My RAM usage is rising rapidly from 2 to 6GB of and ends with the screen is full of squares. Even if I close the document the RAM will not flush and still uses more than 6 GB. The only way is to close the painter and start over. I have never had this problem before with other standard brushes. Wet brushes are memory hogs. I suspect that you have problems with the default Real Watercolor brushes, too, but not as much. There are many things that can reduce the performance. Working at a higher ppi will affect the variant. I work at 100 ppi…you can go up to 150 ppi, but I wouldn’t go any farther. You performance setting in Edit > Preferences > Performance may need to be revisited. How many cores are you using; how much memory are you using? Ram is certainly helpful…the more the better, but there is ram that is slower and ram that is faster. I am finding that processor speed is important. I recently bought a new computer and I splurged on processor speed, which made a definite difference. Have you updated to the latest hot fix for Painter 12.1? I am finding a lot of 12.1 users have not downloaded the Hot Fix for 12.1. There is a speed up of brushes with that hot fix. I wish I knew something to tell you that is concrete, but there are many variables. Thank you for your prompt reply Skip. I am running 64 bit Win 7 Ultimate on a 2.40 GHz processor with 4 cores, and I am familiar with most parameters. 12.1 Hot Fix is installed. Has reduced from 200 to 100 ppi and it helps but I probably have to start saving for a new PC. Any way I hardly ever produce water colors as effortlessly and beautiful as you. Oops…I put up the wrong link. The correct one is posted now. I think I have solved the problem by installing NVIDA GeForce GT 240 last driver for W7 64bit. That is good news to hear. When I am having trouble with Painter, the first thing I do is check my drivers. Once, I was having a lot of problems and found out that there was an update for my BIOS. Once updated the problems went away. Wow Skip, thank you so much for the webinar, I love the soft flow of colors and your “Desert Oasis Brushes” are fantastic. The painting here is gorgeous, I must try the spatter tree look. I can see I won’t get much else done today. Mahalo from Hawaii! It is early in the day for you. You have lots of fun time a head of you. Thanks for dropping by and thanks for the comment. the files downloaded odd for me on my windows 7 pc. they have no file extention and I can’t seem to get the problem figured out. Any suggestions? I just tried to download the files on my Windows 7 pc and had no trouble. I know that You Send it was very busy today and some had to wait to download. I wonder if the files could have been corrupted. The library file should look like this Desert Oasis.brushlibrary. And the category file should look like this Desert Oasis.brushcategory. The extensions are odd looking I think, but they are brushlibrary and brushcategory. If the extension are not present, I would try to download again. If the same problem occurs, try renaming the file and adding the appropriate extension. All you need to do is double click the files and they will install. The brush library creates its own library containing Desert Oasis. And clicking the category installs it into the currently active library. Please let me know if a re-download works. I got them now. I re-downloaded, I think you were right on the corrupt thing, they took a long time to download the first time. This time boom, and they worked like a charm. I have to say, these are absolutely beautiful brushes! Oh Skip, Here it is 10:56pm and I just opened my e-mailon a different cpu. How will I sleep tonight knowing I’ll have to wait til morning to get to your brushes and webinar…but that will be the first thing on the agenda for sure. Also, I was wondering if Kevin does any brush creating? You could put him to work while you paint. LOL. I know what it is like not to paint when you want to. I went 10 yrs. once because I was so busy with my other ministry. It was pure delight to get back to it. Soooo – be good to yourself and PAINT! It is past my bedtime, too. I have just caught up with my classes and can play in the morning with the brushes and maybe do a video or two…we will see. Hi Skip, thank you for the brushes and the download webinair, this is great, I love it, my compliments for all of your work. Yes, the very wet 06A was a variation on Cool Spring > Very Wet 06. The dab is the only difference between the two brushes. I planned to put 06A into Desert Oasis, but I culled it instead. I used it mainly to smooth out the linear quality of 06, but if I use pause diffusion, then I can use any real watercolor brush to do that. I will explain in a video when I finish the cross over list…hopefully today. Skip thank you again for sharing with us the result of so many hours of hard work. What are the characteristics of this collection of brushes from other series, such as Cool Spring …? I have downloaded them and I am eager to try them. You always ask such hard questions. 🙂 This collection is drier in some respects and it pays a lot more attention to paper. Someday, I will consolidate all the brushes into a set of FAVs. Matbe i missed it but ? where do i put brush library? Hey Judy…it’s me…Kevin. The goat is off doing a video so I can sneak out here and chat with you. Don’t call him a Jedi…he loves compliments and then gets all puffed up with big head. Oh, he says he doesn’t like compliments…but don’t you believe him. Paul says he is looking for self-worth externally whatever that means. Anyway…he is unbearable to live with. Y’all don’t know what it is like. Yikes…got to run…I hear him coming. Hugs from your pal, Kevin. Can the Oasis brushes be used in 11 also, or just 12?? These brushes are using the new Real Watercolor brush engine, which was introduced with Painter 12. They are not backward compatible with earlier versions of Painter. 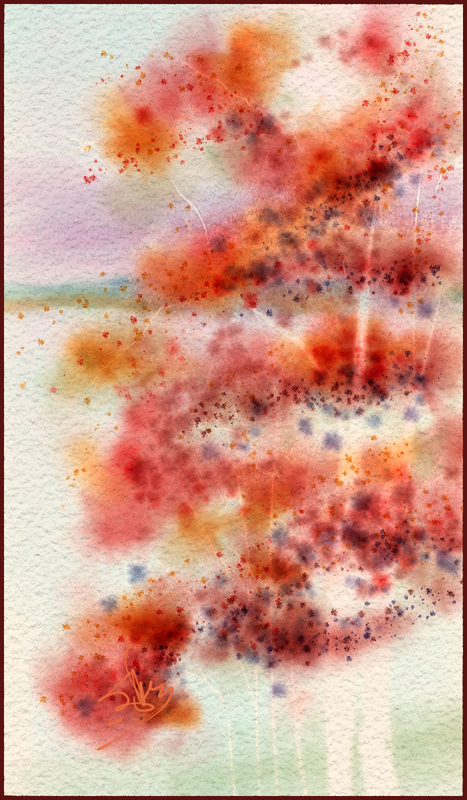 But there are still a bunch of great watercolor brushes available for Painter 11, X, IX. Hello Skip. I could not install the brushes on my Mac. Can I open this document “DesertOasis.Brushcategory”? Which program should I use? We need to figure out why you couldn’t install the brushes. 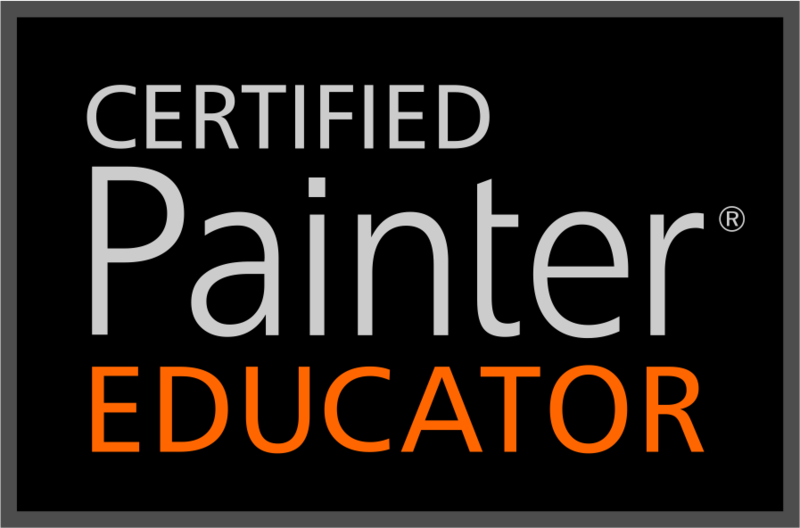 Are you using Painter 12.1? If so, just open painter and then go to your finder and find where you saved Desert Oasis.brushcategory. Double click the file and the category will be installed in your currently active library. If that doesn’t work, there is something else wrong and opening the brushcategory would not help you. Let me know if double clicking on the file installs the brushes for you. Hey Audrey…you are so welcome. I’ll see you in Karen’s OS. Which watercolor set do you generally quickly plot out a background, before refining details within? Thanks in advanced, awaiting reply. I’m so sorry, I missed this note. It’s after midnight here, so time for bed. I’ll try to answer your questions in the morning. Let’s see if I can answer your questions. A. What watercolor set would I use for skin tones. The Brush Category called Soft Water was designed because a friend wanted something that could be used in portraits that wasn’t as runny as most variants are. Even the brushes are named skin, blush, rouge, etc. But that is for a particular style of watercolor. I am partial to portraits done with very runny watercolor. B. Same question for Fabric. Try Cool Spring, Fill 3, Smooth 1, or thick and thin 07. It is hard to get a transparent fabric to show over darker colors. You may want to try a smooth oil or acylic on a separate layer and decrease the opacity a lot. C. I use Cool Springs the most for background. But there are variants in all the categories that will do this. I prefer really runny watercolor for the first washes. Brilliant, thanks a lot for the response! Can’t wait to get a watercolor peice completed. I’ve been messing around with various brushes you offer since my comment, and they are just awesome. Thanks for the follow up. I appreciate your comments very much. It is always nice to hear that the blog is useful. If you have questions, please feel free to ask.